Mr. S. Balakrishnan obtained his Masters in Physics from University of Madras in the year 2005. 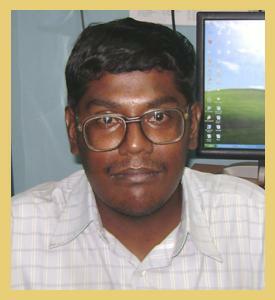 He is pursuing PhD under the guidance of Dr. R. Sankaranarayanan from January 2007. His research interest is in the field of Quantum Computation. Physical Review A 78, 052305 (2008). Physical Review A 79, 052339 (2009). Physical Review A 82, 034301 (2010). New York, USA, 19 - 23 October 2008. Institute of Mathematical Sciences, Chennai, India, 17 – 29 November 2008. Physics, Bhubaneswar, India on 18 August 2009. Tiruchirappalli on 16 November 2009. Indian Institute of Technology Madras, Chennai, India, 21-24 July 2010. Indian Institute of Technology Delhi, New Delhi, India, 17 - 21 December 2007. Institute of Physics, Bhubaneswar, India, 4 - 12 March 2008. CSIR-SRF is awarded for the period of 2010-2012.